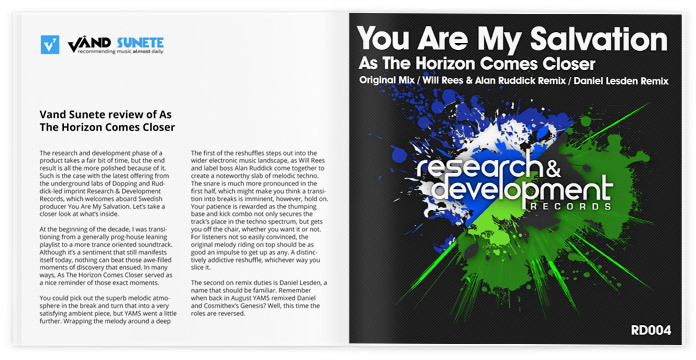 The original piece of music is a hypnotic piece of progressive trance, as deep as it is vibrant with colour. Daniel Lesden sharpens the knife and lends his trademark psychedelic angle to the theme, whilst Will Rees & label boss Alan Ruddick converge to create an evolving and tumultuous example of driving melodic techno. A beautiful example of creatively constructed psy that stays true to the original material, while giving off its own unique vibe. Vând Sunete focuses on track recommendations and features everything from new releases to genre classics. 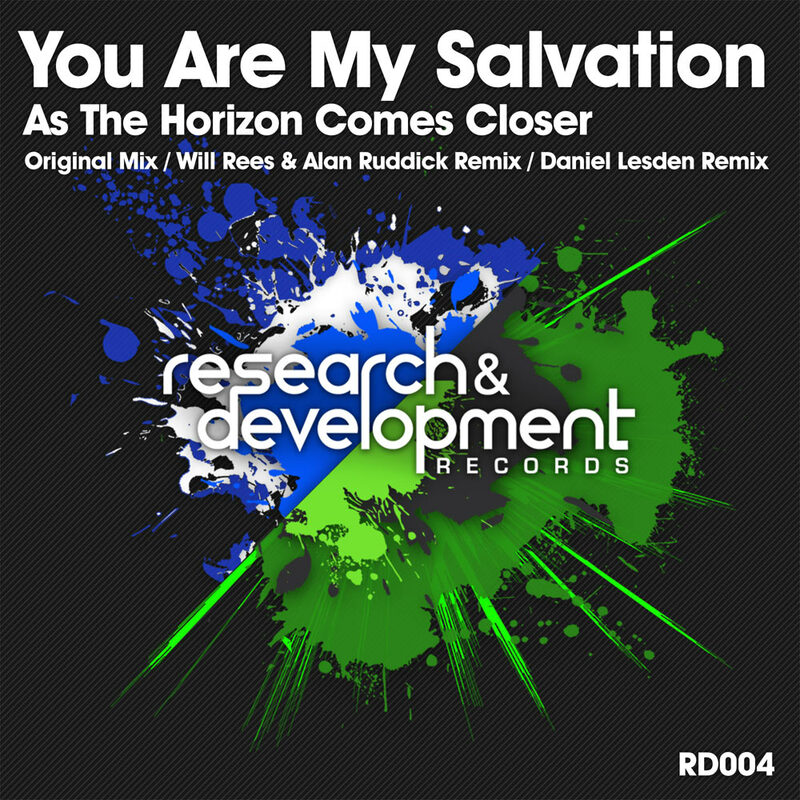 This time he reviewed As The Horizon Comes Closer, new single from You Are My Salvation that features Daniel’s remix. The research and development phase of a product takes a fair bit of time, but the end result is all the more polished because of it. Such is the case with the latest offering from the underground labs of Dopping and Ruddick-led imprint Research & Development Records, which welcomes aboard Swedish producer You Are My Salvation. Let’s take a closer look at what’s inside. At the beginning of the decade, I was transitioning from a generally prog-house leaning playlist to a more trance oriented soundtrack. Although it’s a sentiment that still manifests itself today, nothing can beat those awe-filled moments of discovery that ensued. In many ways, As The Horizon Comes Closer served as a nice reminder of those exact moments. You could pick out the superb melodic atmosphere in the break and turn that into a very satisfying ambient piece, but YAMS went a little further. Wrapping the melody around a deep progressive arrangement, the Swede managed to extend the experience in a smooth fusion of electronic music styles. Truth be told, this original vision does not require any accompanying words, but I had to convey my appreciation somehow. Plus, it would look weird if I didn’t include any text, now wouldn’t it? If this isn’t quite your thing, perhaps I might interest you in some remixes? The first of the reshuffles steps out into the wider electronic music landscape, as Will Rees and label boss Alan Ruddick come together to create a noteworthy slab of melodic techno. The snare is much more pronounced in the first half, which might make you think a transition into breaks is imminent, however, hold on. Your patience is rewarded as the thumping base and kick combo not only secures the track’s place in the techno spectrum, but gets you off the chair, whether you want it or not. For listeners not so easily convinced, the original melody riding on top should be as good an impulse to get up as any. A distinctively addictive reshuffle, whichever way you slice it. The second on remix duties is Daniel Lesden, a name that should be familiar. Remember when back in August YAMS remixed Daniel and Cosmithex’s Genesis? Well, this time the roles are reversed. The mysterious distant sounds in the break serve as mere teasers, prepping the listener for the inherently infectious drive of Daniel’s psy rework. Framed by the precisely placed vocal chops, the tweaked melody makes an eventual entrance, providing all the necessary elements for the oh-so-good goosebumps to occur. A beautiful example of creatively constructed psy that stays true to the original material, while giving off its own unique vibe. As The Horizon Comes Closer, so does the release date for the EP, with this triple track offering hitting Beatport this Monday, October 26th. If you prefer other portals, November 9th is the date to mark in your calendar.